it is friday evening and i am sitting here alone in my living room typing on my ibook, writing tonight's weblog entry. it's warm and quiet in my house, peaceful and calm. i've been waiting all week long for this, to just sit here and have nothing to do, totally vegging out, my mind a complete blank, not a care in the world, passing the time. i had some corn chowder from a can for dinner tonight (did i have soup from a can last night as well? ), wasn't in the mood to make anything more complicated than that. i watched cq on cable, about a young filmmaker living in 1969 paris working on a barbarellaesque science fiction movie, obsessed with filming every aspect of his private life, having problems with his girlfriend, ends up falling in love with the leading lady of the film. it's a pretty interesting movie, made even more so but the soundtrack, bubbly 60's scifi music mixed with some new wave french tunes. i spent the day at work feeling tired, like i was all worked out. i planned on going running and i had all my clothes, but by the time the afternoon came around, i was too hungry to do anything. i had no idea what i wanted to eat but i just headed out to chinatown to do some wandering. 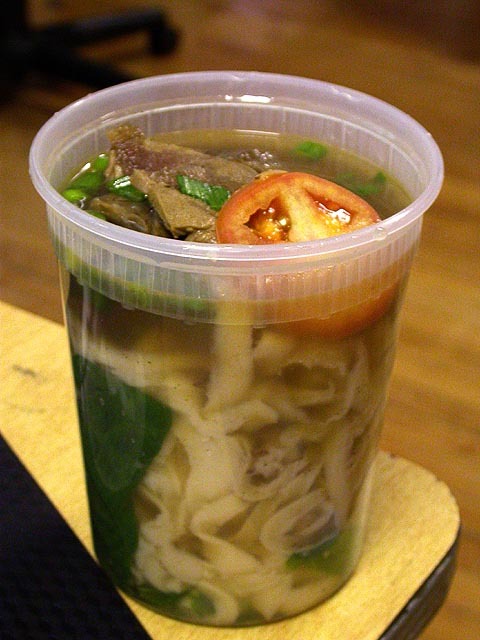 i went to the noodles alcove, which seemed like a very nice place to enjoy a meal but i got some takeout, "dao shiao" ("knife sliced") beef noodles. i wandered chinatown a little bit more while waiting for my order to be ready. i went to this aquarium store next door. even though there was a big sign that said "aquarium," the view from outside looked like a music/video boutique. turns out it was both, half of the store sold cd's and dvd's, while the other half had all these fish tanks of goldfish. they're so pretty, red and white and black, i sort of wish my cherry barbs at home would die soon so i can buy some nice goldfish instead. it was so photoworthy, but i didn't want to look too suspicious by taking out my camera so i didn't. next time, i'll need a decoy to distract the manager while i take a few snapshots. 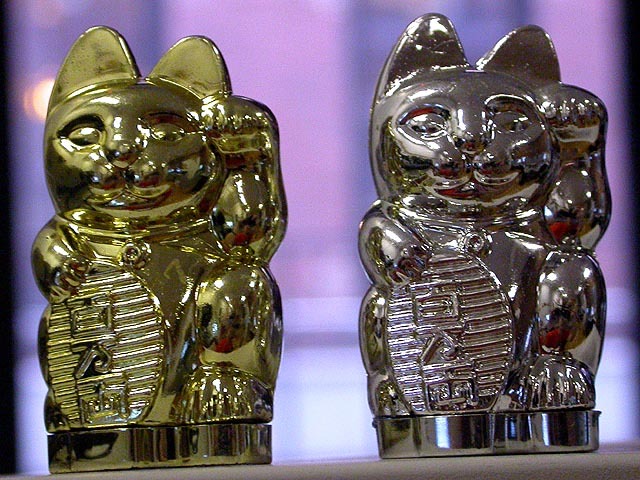 then i went to that confectionary store and got some dried prunes and these little silver and gold fortune kitties that are actually secret tiny candy cases.